Thus spoke Deborah Holzel, my older sister. She was on stage at Second City Hollywood performing improv with a group dubbed the Class of 1898, a name that makes me think of William McKinley and the sinking of the Maine, but not a troupe of elders who came of age in the 1950s and ’60s. “As you get older, you don’t have as much to lose,” she told me, explaining what gave her and the others the freedom to stand in front of an audience and tempt failure. The only other age as creatively free as seniors, she said, are children under 10. In our family, Deborah is more associated with the classics than blackout sketches. At 16, she played Medea at Cass Technical High School. Three at the time, I was too young to appreciate Euripides’ tragedy. The last time I saw her act was about 1970 in a production of Chekhov’s “The Three Sisters.” This being Boston at the end of the ’60s, the theater played the new Beatles album, Abbey Road, during intermission. Deborah soon gave up theater for social work, so it was fun to watch the video of the Second City performance and see my big sister in action. In one skit, everyone played a different type of radio station. Deborah was the well-modulated voice of NPR calmly announcing disasters in Texas and Florida. In another skit, where Deborah and two other women were told they were baseball players, Deborah was described as “the scrappy, short haired one.” Deborah laughs at that. The lowest-keyed Holzel, she’s never been called scrappy. Deborah wants to keep at it. Maybe next time she’ll be the one ordering the frozen yogurt. Failure is an orphan quote. “Go green”? “Less is more”? Why, exactly, are there quotation marks around these phrases (which I found in a newsletter)? Certainly not because they’re quotations. They’re what my friends Kim and Elizabeth, nimble writers both, call orphan quotes. Orphan quotes are quotation marks that people habitually use to surround a word or sometimes two. More recently they’ve broken out of the written sphere, becoming air quotes. I’m very much against them. My hard line on orphan quotes was solidified when I read a pamphlet called “On Punctuation,” which my friend Glenn had given to me. “Quotation marks should be used honestly and sparingly…” it advised. Now that I’m able to search for it online, I find that what I thought was a pamphlet actually is a chapter in a book of essays, The Medusa and the Snail, written by Lewis Thomas and published in 1979. Simply put, people use orphan quotes when they use a cliche or some other form of lazy writing they don’t want to take responsibility for. It’s cowardice. For a couple years now, my friend Ben has been carrying out a worthy crusade against the misplaced apostrophe. And so I was glad to discover today that the Blog of Unnecessary Quotation Marks is performing a similar public service by cataloging misused quotation marks. It’s where I snagged the photo for this entry. To quote Dr. Thomas: “The most objectionable use of quotation marks … is seen in advertising, especially in advertisements for small restaurants…” To look at just a few of the blog’s photos amply proves this point. No teeth whitening so far today. Doctor Prescribed HGH — Competing with younger men? The 300 Workout — Get Ripped! Click here. Build huge biceps fast! Results may vary. 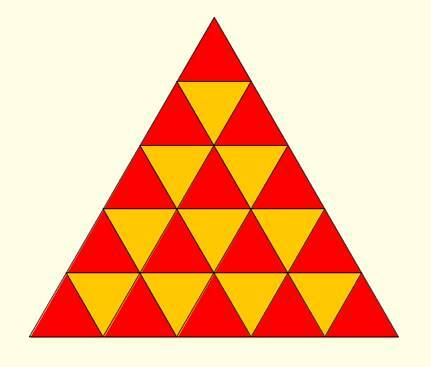 How many triangles can you count?